urgh! 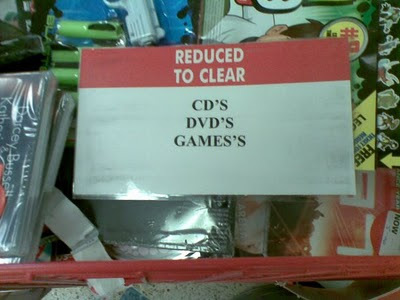 don't get me started on these idiot apostrophes! There's a big sign on my way to work, saying: Dream Wedding's Exhibition. I'd love to meet Mr. Dream Wedding and hit him over the head. I totally agree with you that mistaken ambitions lead the students to the failure. Find more interesting things by visiting cheap essay writing services its all for you. It should be up to the student to chose his field some parents want to make their son a doctor but maybe he has been dreaming of to be an engineer. Parents should not force a student to select specific field.